In some ways, 2012 feels like a wasted year for art. Unusual circumstances ended up taking a lot of time away from making art. At least I was keeping busy, and things were accomplished that needed to be done eventually. Every year since I started this blog I have used New Year's Eve to look back at my year in art according to several established categories, so that tradition continues. Prints- For the first time in a while, no new boardwalk prints were completed. Only three new prints at all this year- two made specifically for theme shows, and one new saint. I did end up creating two new artworks from older previously cut blocks; the blocks made in 2010 for the international collaborative postcard show were both reworked into new prints for shows this year. Shows- Again, no solo shows this year, but I had 10 prints in 7 group shows. Publicity- I was interviewed about my work at the faculty show earlier this month, but so far I have not seen the results. My house themed piece was used to publicize the Gimme Shelter show, appearing in a local paper and on internet based postings. Awards- My piece in the big annual juried show in Belmar was awarded Best of Show, my second time getting that prize in this show, and the third time one of my boardwalk prints won a prize at a Boatworks show. Firsts- I had helped print editions for other artists as a grad student, but this year I was sought out to print another artist's work as a professional. I've taught woodcut many times, but this year I taught a one day linocut workshop for a local event. 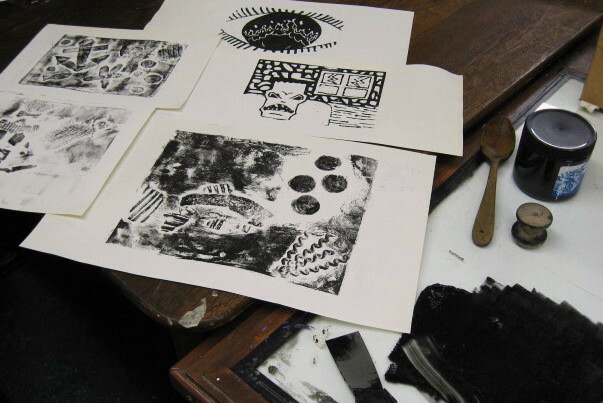 Miscellaneous- The woodcut workshops I have been teaching for the Belmar Arts Council have been a hit, with three more sessions done this past year, and requests by the students to continue the class next year. 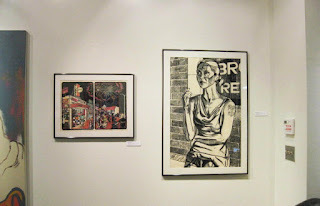 Damage related to Hurricane Sandy caused the destruction of large amounts of older work- prints, blocks, and paintings. The Studio- We finally got proper windows in our space, after being told they were coming for six years. Our critique group celebrated five years of monthly meetings, continuing to add new regulars to the core group that has been part of it from the beginning. 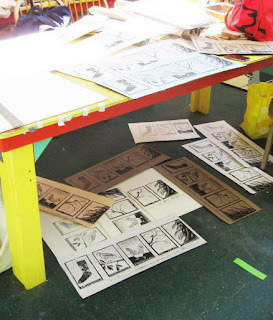 The linocut class was held there, and when Sandy shut down the Boatworks, I used the space to host the last two meetings of the fall BAC woodcut class. Despite the heavy regional damage caused by Sandy, the building survived its second consecutive year with a major hurricane with no significant damage. 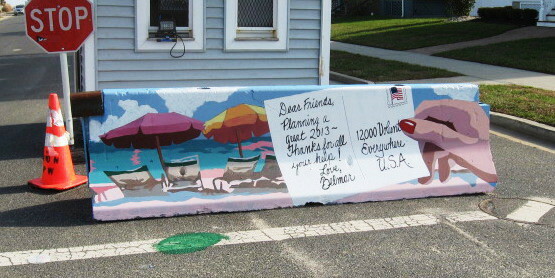 Next Year- I am scheduled to get a big chunk of wall to fill as part of a 5 person award show in Belmar in February, though what will go up there is not yet determined. Nothing else is locked in yet, but I do expect to get more boardwalk prints done, as well as other projects, look for some more shows, and teach more local woodcut classes. Christmas Day has come and gone, but as far as I'm concerned, Christmas doesn't truly end until I get all my Christmas cards done and mailed. I finished printing all of them more than a week ago, and colored enough to have them for family that I'd see in person, but most of the print run was still sitting on a shelf. I had nothing else that needed doing last night, so I colored the rest of the run in one long session. Using the prototype that I finished for the one posted here on the blog, I did it in my usual assembly line style, applying the colors one at a time to the whole set, then moving on to the next color. This image (based on a John Singer Sargent painting) required 11 different colors. Took several hours, but I finished the set late last night. This morning I did the folding and trimming steps, which take a lot less time than the coloring. Late tonight I started writing them out, my goal being to get cards out before New Year's to all those who have actually sent them to me. 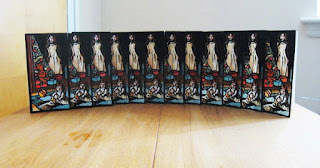 I'll get those, and maybe a few others from the mailing list, to the post office tomorrow. The rest can wait until January. The end of the semester teaching schedule has meant that I haven't gotten my Christmas cards out before Christmas in years. Some years I still haven't even printed all of them yet, much less colored them and written them out, by December 25th. At least this year they are all printed, and several are colored- the one to show above and a few others that will be handed out personally today. 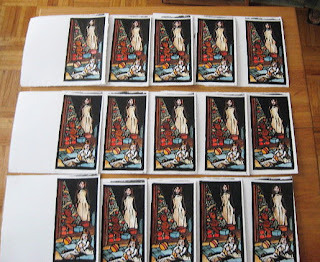 I'll color the remaining proofs assembly line style, and at least get the first ones out (people who have already sent me cards) before New Year's. Had some time to spare early in the day, so I decided to get up to the Studio and print the rest of my edition of Christmas cards. However, before doing that, I decided to check something else first. I had pulled a practice proof on the new paper last week to make sure that it would print well, and was happy to see that it did. The proofs I pulled of this year's card a few days ago also worked well. But I wondered how this stuff would work with my watercolors. So while my hands were still clean, I took that practice proof from last week and colored it to match my sample of that card. The watercolor worked fine, so I went and tried copying colors from the original painting. The first attempt was not quite right, but the paper took the watercolor fine, so I put away the paints and set up to print. Small prints go fast. 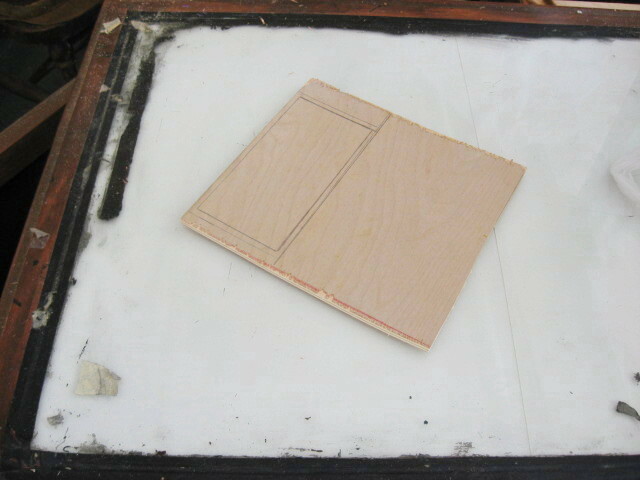 Less than a minute to ink the block, a piece of tape to protect the folded card's back from the printing process, then paper on top (what you see above) and rub it. 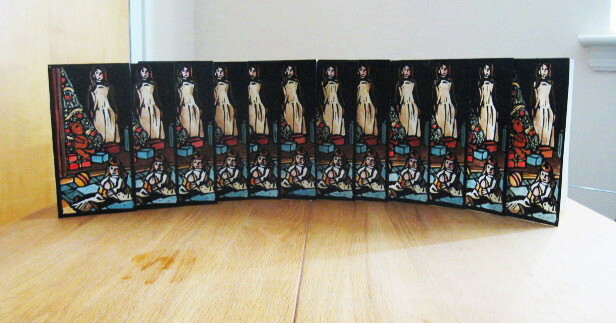 Cranked out 14 more cards from the paper I had torn down, then cleaned up and got on with the rest of my day. I might actually finish making them before Christmas. This last week of classes has me busy, and I hadn't had time to start working on this year's Christmas card. Spent a lot of time thinking about it, but nothing was drawn, much less cut. But the day is a week away, and though I don't expect to have them out in the mail by then, I do want to have a finished one to post here next Tuesday. No school today, so I took my prepared wood and a bunch of books up to the Studio this afternoon. Sitting down, I had two possibilities in mind, and did quick sketches of each idea. Based on the sketches on paper, I chose one design and put it on the block. Took about an hour to cut it, and I pulled half a dozen proofs. Some proofs are slightly better than others, but all could be used for finished cards if the colors are right. I'll try to print the rest of the cards and begin coloring toward the end of the week. As for which painting I chose as my starting point, as is my custom I won't reveal that until next Tuesday, but I'll give you a hint- it can be found in my mid-1980's edition of Gardner's. 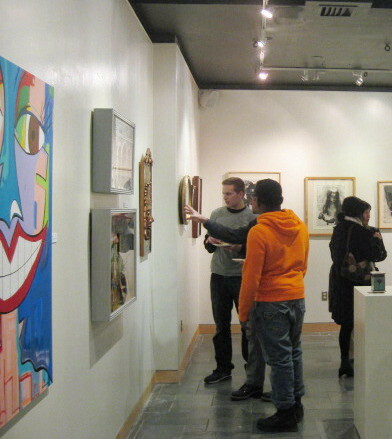 Things have been a little quiet around the Belmar Arts Council the past several weeks. Besides the immediate disaster in Belmar caused by Sandy, the town, which technically owns the Boatworks, has needed the building as a headquarters for the collection and distribution of aid supplies for victims of the storm. So no shows there for the time being, and I ended up moving my woodcut class to the Studio to finish out the remaining sessions. The expectation is that we'll be able to return to the Boatworks in early January, and get it fixed up and back to business by the end of that month. But that doesn't mean we don't have art going on. Though water flooded large parts of the whole town, the heaviest damage occurred up by the beach, with pretty much the entire boardwalk and everything along it destroyed. 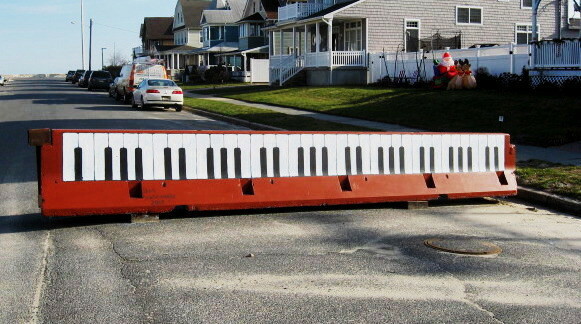 Once the town was reopened to traffic, drivers found that concrete barriers (often known as Jersey Walls) had been placed across the right lanes of east bound avenues where they crossed A Street, to help divert non-local traffic away from Ocean Avenue and all the heavy work going on up there. Those concrete barriers have been doing that kind of job well for half a century, but that gray concrete isn't exactly pretty. Since these things are expected to remain in place through the spring, it was proposed to make them nicer by painting them, creating a new series of temporary murals around the town. Volunteers from the Girls Scouts and the BAC have taken up the job. There's been too many rainy days since this idea was hatched, and I've known going back to the first BAC mural that paint doesn't dry easily on concrete when the temperatures drop toward winter. But we've had a few nice days in a row, so artists were out in force today, and I was on foot getting photos of painters in action. Above and below are two examples of completed murals (8th and 10th Avenues respectively). There are a dozen other such walls between 7th and 20th, and at least several in progress. 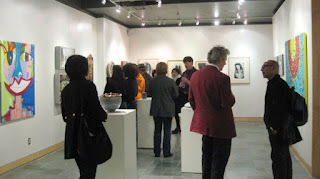 Photos of the others will eventually get posted to the Belmar Arts Council blog when I get enough of them. One week left of school in the fall semester, which means that some of the students have finally realized they are almost out of time to finish their assigned work. 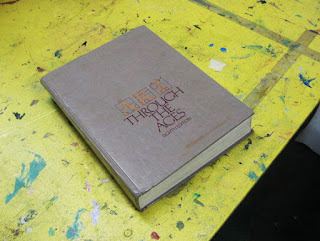 All my classes are given some kind of print project, which we did in class weeks, or even months ago. They start them in one class, and we print the results in class a few weeks later. (the hurricane meant that in some cases they ended up with a lot longer to finish their blocks and plates) I have a tote bag with my portable printing kit- a glass palette, black ink, and a variety of brayers and printing implements, along with my print shop apron. I bring it on the planned printing day, but I usually don't have time in subsequent weeks to set all that up, so I just bring late arriving projects back to the Studio and quickly print them there. The above photo is actually from two years ago, but it's a lot like what I dealt with today- a mix of woodcuts and collagraphs that were turned in over the last week. That was completed quickly, so I took advantage of the relatively nice weather to take a walk and check out some art on Cookman Avenue. I haven't had time to set foot in Asbury since before the hurricane. Didn't bother to wander up to the boardwalk, just to some galleries. As with neighboring Ocean Grove, no sign of storm damage at the end of town away from the beach, though I heard stories of significant destruction from people who live and work closer to the shoreline. Didn't get any further with the Christmas card yet, but I hope to get it drawn and cut in the next few days, so I can print them early next week. 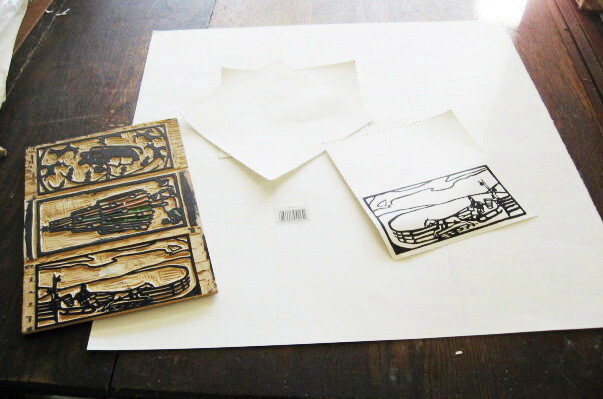 Christmas is now less than two weeks away, which means that I need to get going on my annual woodcut holiday card. I think I have my artist of the year picked out (as usual, I'll keep the design under wraps until the 25th), but there are other tasks that have to be done as part of making the card. I had a few things I needed to get done before class tonight, things done easier at the Studio, so I headed up there this morning with a list of things to do. Down in the basement I was surprised to see our door open and the lights on, since I don't typically see Molly there on Thursday mornings this semester. Not Molly, but her friend Grace, who has printed there before. When I last saw her in the spring, she was producing multi-block woodcut menus for special multi-course theme meals at the restaurant where she is a chef. 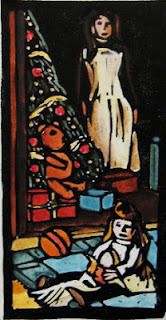 (this woodcut menu thing has been discontinued, much to her disappointment, which got me to thinking that more businesses should have woodcut artist as a paid position) Today she was printing Christmas cards. The block was already cut, so she's a bit ahead of my pace. 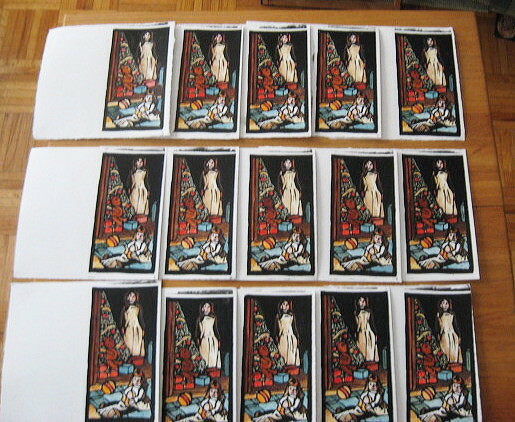 She actually had 5 designs all cut into a long block, which were printed on a single piece of paper (see above) and will be cut apart later to make postcard style cards. I began my day there by grading a big pile of student work, easier on my large work table than on my kitchen table at home. Then it was time to start my card. I usually put two or three cards on a single piece of wood, but I don't have any small blocks with empty space, so I started a new one. Cut a piece of birch large enough to have two cards- one for now, one for next year. Printing cards requires something stiffer than typical printing paper, both so it can survive the trip through the mail without getting crumpled, and so it can stand up when the recipient displays it on a tabletop. 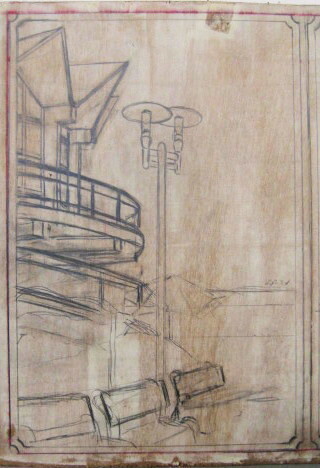 In the past I had picked up sheets of something like bristol, or very thin hot press watercolor paper. A 22" x 30" piece ran 2 or 3 bucks, and could make 12 cards. Unfortunately, the places I have picked up such paper have either gone out of business or moved, and it's not worth doing a big mail order for just a few sheets. Luckily, Molly tipped me off last year that our campus bookstore carries some papers in a little flat file type display. Not many options, but a few decent papers and all for relatively cheap. 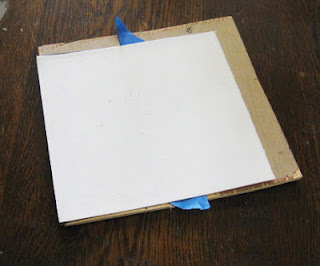 Last week I picked up a couple of sheets of what they called white posterboard, but looked very similar to what I usually use to make cards, and only 40 cents each. I was going to be back on campus tonight, so I wanted to test print the paper to see how it printed, in case I wanted to buy more, or try something else. 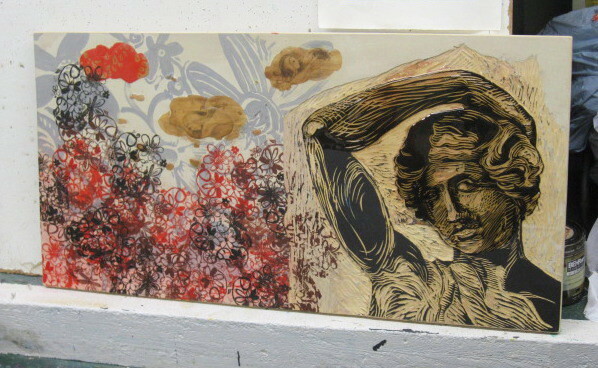 I tore it down to make some smaller sheets and tested it with oil ink and an old card block from several years ago. Grace is accustomed to printing with a press and mentioned experiencing difficulties hand printing on heavier paper, and was curious to see how I'd print it. Using some of my repurposed objects, it took only seconds to rub the print and she was impressed with how cleanly the image printed. So back on campus tonight I picked up a couple of extra sheets of the same paper, paying with loose change from my pocket. The next step is to finalize the idea, draw and cut the block by this weekend, so I can print early next week and have them dry enough to color well before Christmas Day. The Fall Salon 2012 Faculty Exhibition, combining full time and adjunct faculty for the first time, was installed just before Thanksgiving, and opened the week after that, but tonight was the show's public reception. The odd circumstances of this show resulted in me having two pieces the show, as seen above. I brought my classes through over the past few weeks, and many others have had the opportunity to see the show so far, but an official reception brings out a different crowd, at least as long as the refreshments hold out. I don't think the crowds were as big as the previous adjunct only shows (we have 17 adjuncts in this exhibition, along with 4 full time professors), and some of the professors just hung around out in the hallway, never making into the gallery itself. But I had plenty of people to talk to- faculty I haven't seen in a while, first time visitors, and I did a brief interview (university relations, I believe). There are always some people curious about my process and subjects. And at the same time I was able to get information from my fellow faculty about their works, things my students asked about during our class visits. The reception officially ended at 6:00 pm, but the gallery didn't empty for a while after that (the hallway had emptied when the cookies ran out), and I hung around after for a while to allow the rush hour traffic on the parkway to clear. The show should remain up at least through next Wednesday, December 19th. The work will start being picked up after that, so if you're planning to see it, better not wait too long. Today one of my Belmar woodcutting students came to the Studio to make up for time missed due to Sandy related complications. Didn't get any photos, but she gets one more visit, so maybe next time. Early in the week I'm often catching up with reading the weekend paper. The Times this past weekend had an article about recent problems at the Westbeth. It's a complex of buildings occupying a full block in the West Village, with inexpensive artist residences, large basement studio spaces, and big gallery spaces. Thanks to those amenities, many of the residents have been there since the place opened in the late 1960's. I am familiar with it mostly because I had some work in an exhibition there about 16 years ago. 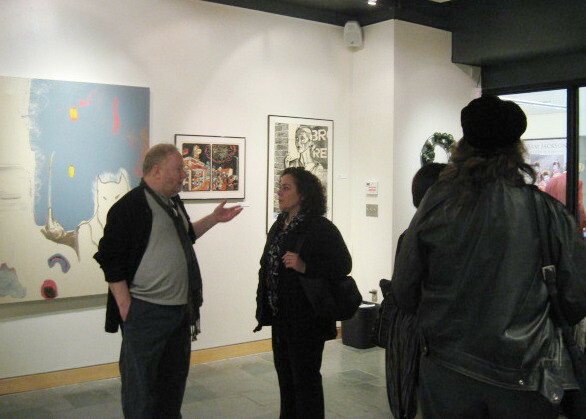 One of the faculty at Montclair State had some kind of connection there, and so they seem to have had a series of juried exhibitions there for students and alumni. (it was called the 3rd Biannual such show, though I never heard about the two previous ones, or any subsequent shows there) I was then recently back from the midwest, submitted three recent prints, and had all three accepted. It was a very nice ground floor space, big enough to hold a show with 153 works from 112 artists (most only had one piece in the show). 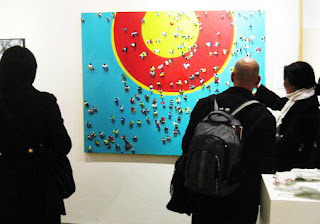 My first time showing work in New York City. But that's not the connection I'm thinking about right now. Though Sandy came ashore a few dozen miles south of where I live, it also did serious damage up in coastal areas of New York. 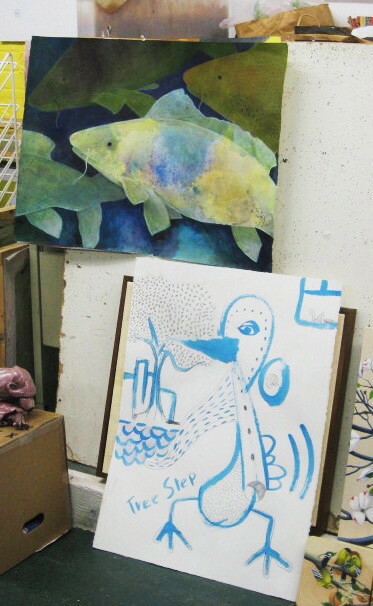 The tunnels and subways were flooded and out of commission for days, so it's not surprising to read that the extensive Westbeth basement studio complex was also flooded, with up to 10 feet of water. Studios that sometimes had more than 40 years worth of an artist's work. Citing dangerous conditions, building management wouldn't let the residents down to the studios for more than a week, by which time there wasn't much left to be saved. In my case, the delay in getting down to my flooded art storeroom was only a few days, and it was only about 2 feet of water, and the only artwork of mine that I had that was over 40 years old (a framed nursery school painting) was safe in my apartment, but I do know what it's like to make many trips into a flooded basement, rescuing what could be saved, and hauling everything else to the trash pile. We're now a week into December, a time of the year when many get to thinking about the holidays. Being a college professor, I tend to be more concerned with the approaching end of the semester. Just two weeks left to get students through their final projects, papers, etc. As a result, I rarely get my annual woodcut Christmas card out before January, and it would be good if I started working on it soon. But it would also be good if I could get this current boardwalk block done, so when I had a little spare time today, that is what I chose to work on. The past few times I had been concentrating on the right side, but today I decided to work on the left side drawing. I had things roughly in the right place for a while now, but I needed to clean up a lot of details, and fix some internal proportions and perspective. So I fixed the angled roofline, the banks of windows, the railings, and the curved balcony and the supports that hold it up. The benches were also more or less where I wanted them, but I wanted to change them from generic park benches to the specific type found in that location, so I studied a photo I had stored in my camera, and worked from that. I redrew the one on the right a few times, but never quite got it right this time. I did get as far as sketching in the wooden backs of the benches in a more accurate way. The rest will eventually follow. It's only been 3 weeks since our last critique group meeting, but Molly and I thought it best to get back to our regular schedule. Besides, most of the people at our November meeting had to miss tonight, while many regulars who missed last time were here tonight, plus one newcomer. 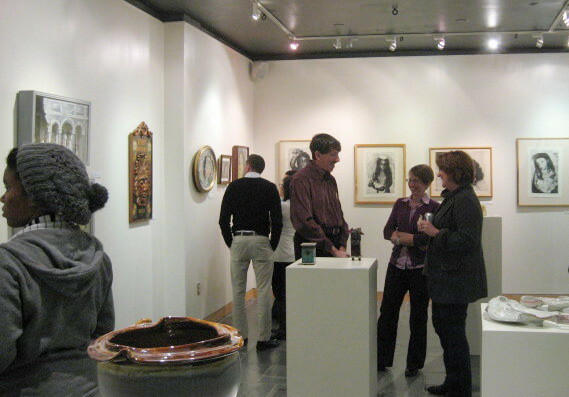 Most brought art to show. Above was the opening round on the main tack board. 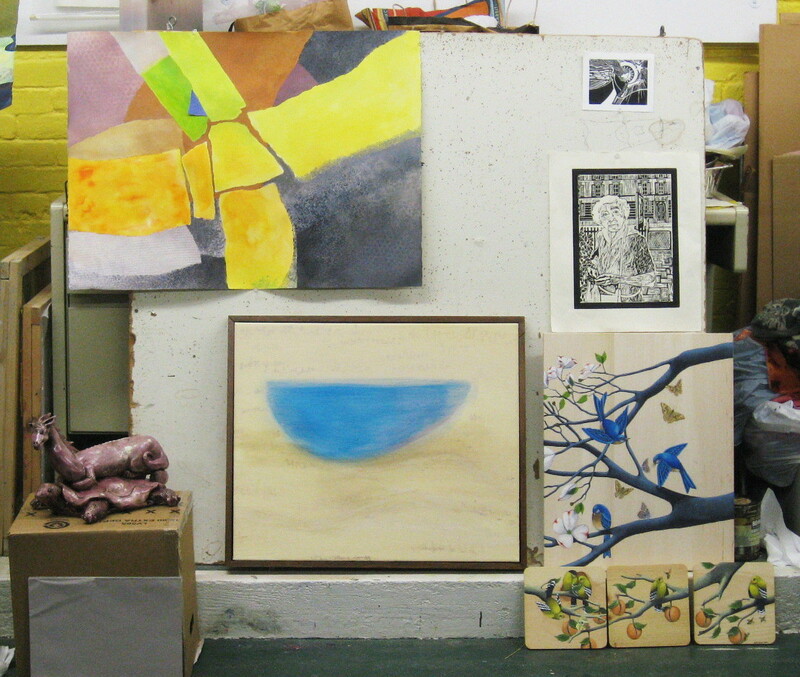 Top row: mixed media painting from Ani and woodcuts from Mary. 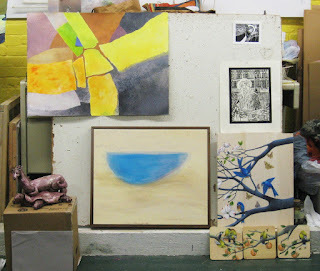 Bottom row: ceramic sculpture from Margery, a painting from Sheilagh, and a group of new paintings from Katie. Below: Another mixed media painting from Ani, and Tim's latest bird themed mixed media drawing. 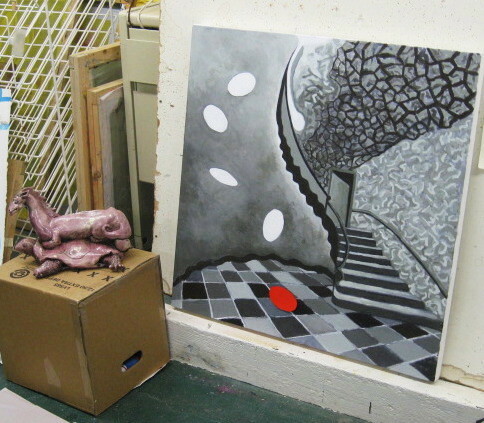 Above, Margery's ceramic sculpture again, and an updated and improved version of a painting that Edy had shown us back in August. 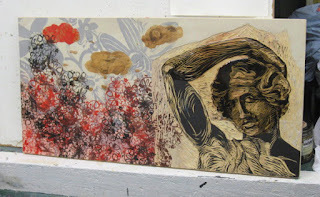 Below, a mixed media piece that Molly has been working on for at least five years, but now declared finished. I decided not to show anything tonight. I had my current block with me, but I only had a few more hours work on one building since then. Maybe before January I can get all the backgrounds finished and advance it far enough for it to be worth seeking new feedback.